On May 14, 1995, Gedhun Choekyi Nyima, aged six, was recognized by His Holiness the Dalai Lama as the 11th Panchen Lama of Tibet. Three days later, on May 17, 1995 he along with his family went missing. Their whereabouts are still unknown. The abduction of the Panchen Lama provides a preview of China’s plan to interfere in the eventual reincarnation of the Dalai Lama. The Panchen Lama (Tib: པཎ་ཆེན་རིན་པོ་ཆེ།) is one of the most important religious leaders in Tibet. The 10th Panchen Lama, a vocal advocate of Tibet cultural and identity passed away mysteriously in 1989. In 1995 Gedhun Choekyi Nyima, was recognized by His Holiness the Dalai Lama as the 11th Panchen Lama. Just weeks later, on May 17, Gedhun Choekyi Nyima was ‘removed’ from his home by Chinese authorities, along with his family; he was just six years old and there has been no concrete news of his, his families, whereabouts since then. Shortly after Gendun Choekyi Nyima’s detention, the Chinese government installed another young boy, Gyaincain Norbu, in his place. 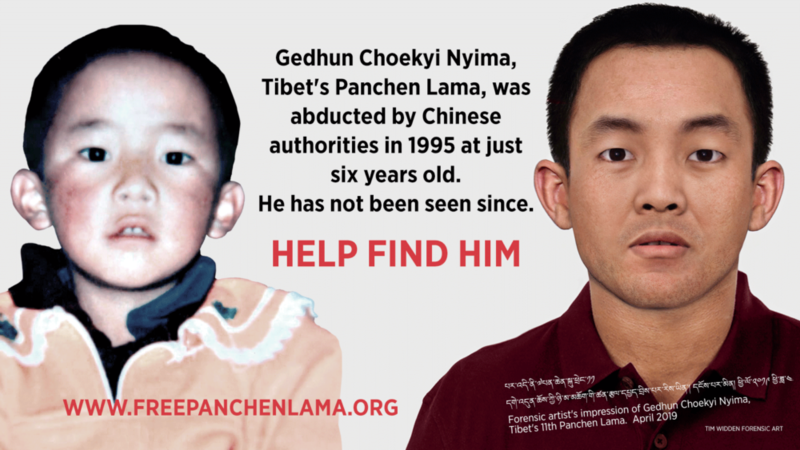 For many years this puppet Panchen Lama was kept hidden, but for the past few years, Chinese authorities have used Gyaltsen Norbu as a mouthpiece for their propaganda campaign against the Dalai Lama. Tibetans continue to revere him as a strong figure for Tibetan identity and nationhood. In June of 2012, Jigme Dolma, just 17-years-old, took to the streets in Tibet issuing flyers and shouting slogans for the release of the Panchen Lama. She was severely beaten and handed a 3-year prison sentence. His Holiness the Panchen Lama will turn 30 years of age on April 25, 2019. This should be an occasion of great celebration for Tibetans everywhere; but instead we will mark this occasion in protest and with sadness as the Panchen Lama has been a prisoner of the Chinese government for 23 years. May 17, 2019 marks 24 years of his enforced disappearance.